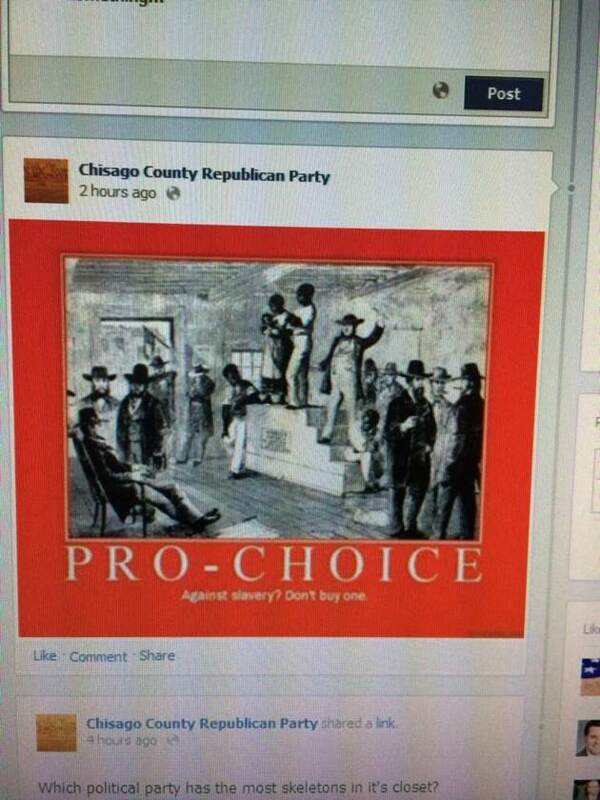 The Chisago County Republican Party sparked a firestorm of criticism on Wednesday for posting an image of a slave auction and the message: "Pro Choice; Against Slavery? Don't buy one." The posting drew national attention and wide condemnation and came at a time when the Minnesota Republican Party has worked to diversify its ranks. The Facebook posting was left on the Chisago Republican site much of Wednesday morning. By early Wednesday afternoon, it had been taken down with no explanation. By late Wednesday afternoon, the local party unit's Facebook page had also disappeared and then reappeared with an apology. "The Chisago County Republican Party is very sorry that something so clearly improper (either intended or in poor taste) ever made it to our page. Postings like this are not representative of our party," the new posting signed by the Chisago County Republican Executive Committee said. The new message indicated, given the large number of people who could post to the site, they had not located the person responsible for the post. Along with the penitent message, many other posts were removed from the site. By the time the post was removed, more than 1,000 people had already shared it and at least half that many condemned it on social media. Radio host Ed Schultz also drew attention to it online and DFL Chairman Ken Martin called on his Republican counterpart to repudiate the posting. "I find the reference to slavery disgusting and reprehensible," Martin said in a statement. "How can a party work so hard to sell themselves as multi-cultural and welcoming to others when their leadership approves and publicizes racist photos to make a point?" In response Downey used the social media site to say he agreed. He also said the Facebook page owner had many people authorized to post on it and it was “being cleaned up by the local site owner." Minnesota Republican Party secretary Chris Fields said in an interview that he found "absolutely nothing offensive about that (Facebook) post." Fields said that as an African American man he finds slavery reprehensible but saw the post as a reminder that the Republican Party started as an abolitionist party, at a time when Democrats supported slavery. Post by Chisago County Republican Party. 1) Updated with comments from the Minnesota Republican Party's chairman and secretary. 2) Updated to integrate comments. 3) Updated with the Chisago County Republican Party's apology. Bachmann: Obama defending a "health care system that won't work"